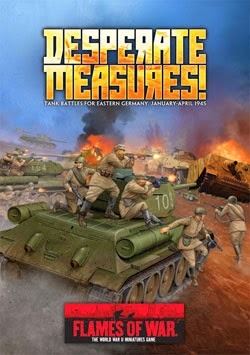 Late in 2013, Flames of War re-launched their Late War Eastern European Front books and models with the release of Desperate Measures. 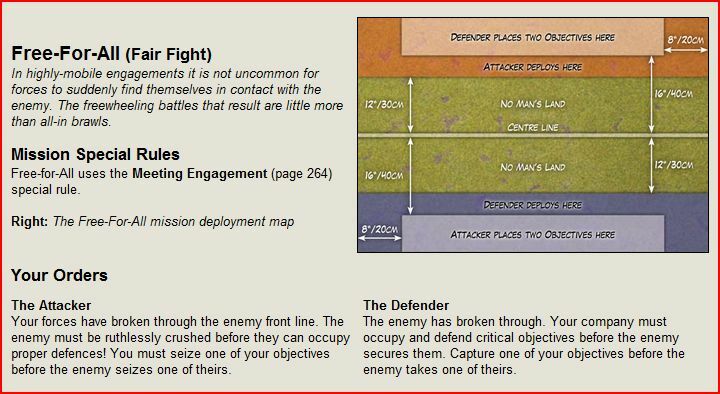 The slim guide to the German and Soviet forces of 1945 is packed with lots of fun and flexibility in fielding tons of armor and mechanized troops slugging it out in the final months of World War II. 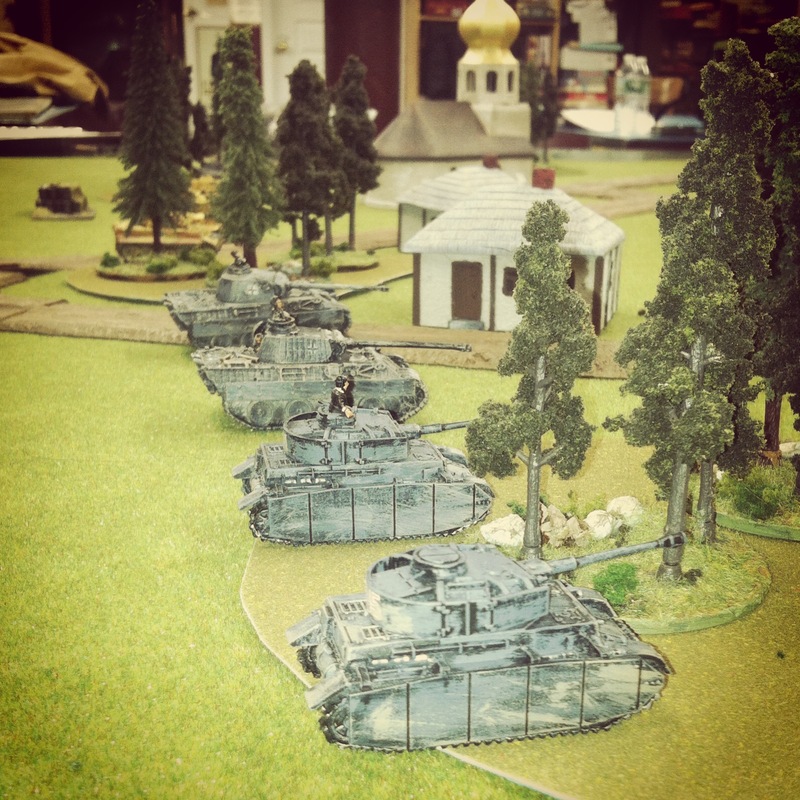 My usual FOW gaming opponent at Metropolitan Wargamers in Brooklyn, NY has made a sizable investment in Soviet models and Eastern Front terrain. His rural church model in particular looks fantastic on the table with real gold leaf applied to the classic onion dome. 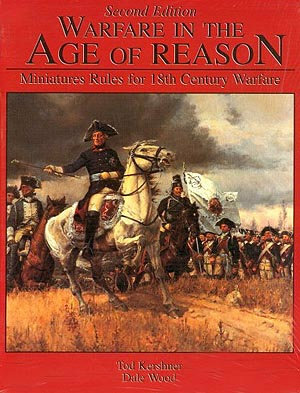 Playing from the Desperate Measures book for the first time this past week allowed me to field a bunch of German armor which has mostly sat idle for a year or two as I’ve focused on playing Allied forces in Western Europe. My German list was a Confident-Trained Panzer Kampfgruppe with a Panther G HQ, two Jagdpanthers, two Panzer IVs and a Confident/Veteran Schwere Panzer platoon of three Tiger I Es. The Soviets rolled out a Confident-Trained Tankavoy Batalon with a T-34/84 obr 1944 HQ tank, a platoon of seven T-34/84 obr 1944 tanks, a ten-tank T-34 obr 1942 platoon and two four-gun platoons of the heavy SU-100 tank killers. 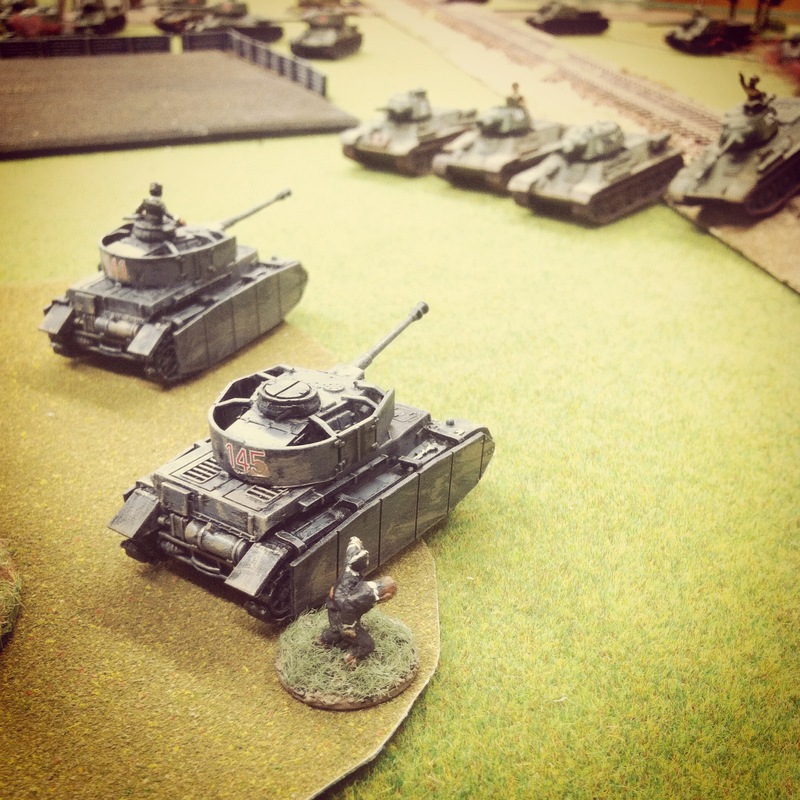 At 1500-points on a side, there was a ton of Soviet hardware sitting on the tabletop against a small, but diverse German force. This was my first time playing these lists, so we went with a straight-forward Free-For-All from the basic FOW missions list. The table presented a mix of woods and buildings for cover, and roads and a railway cutting across the table. 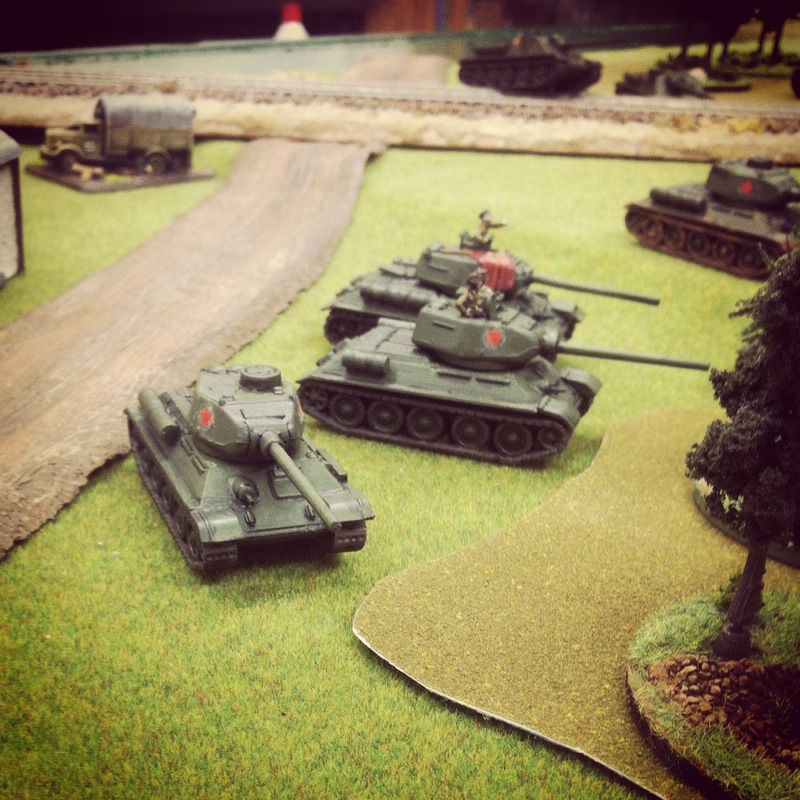 We placed out objectives, deployed our lines of tanks and the Soviets rolled for the first turn. 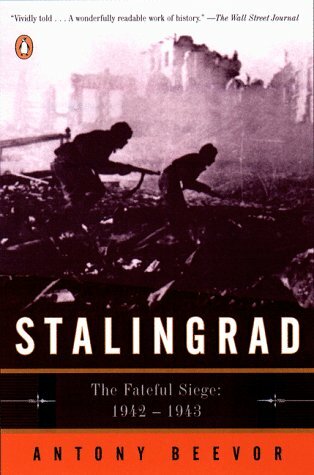 With the Soviets beginning the game as having moved, they weren’t able to take any valid shots. The T-34s pressed to the edge of the railroad tracks on their left and the central forested area at the middle of the table. On either flank, the SU-100s sat parked and looked to take advantage of their ability to re-roll misses by firing from stationary positions. 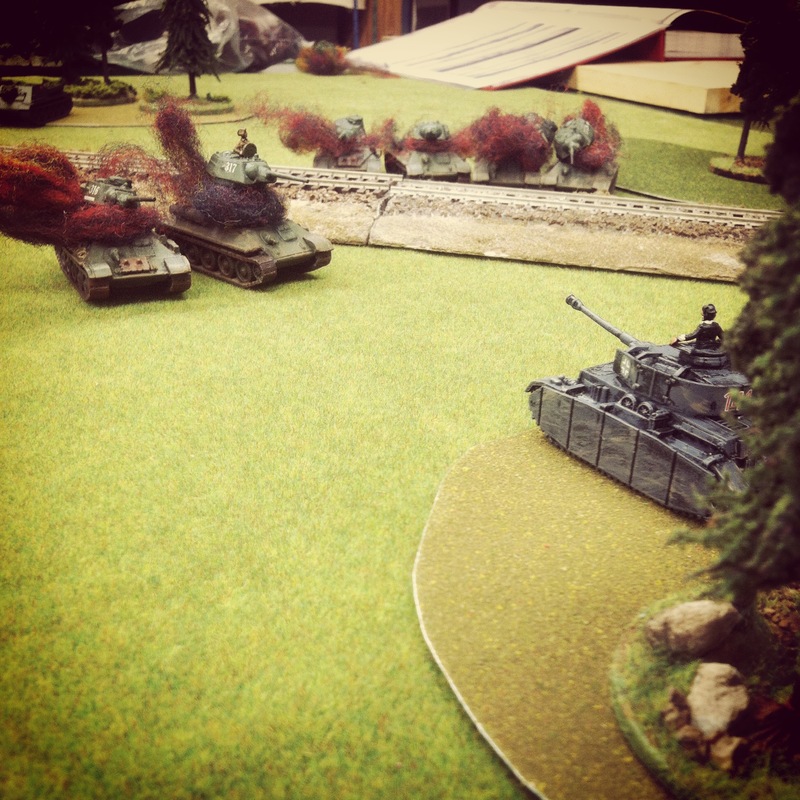 I perched my Jagdpanthers in a wood at my left flank and aimed at one platoon of SU-100s in the distance. 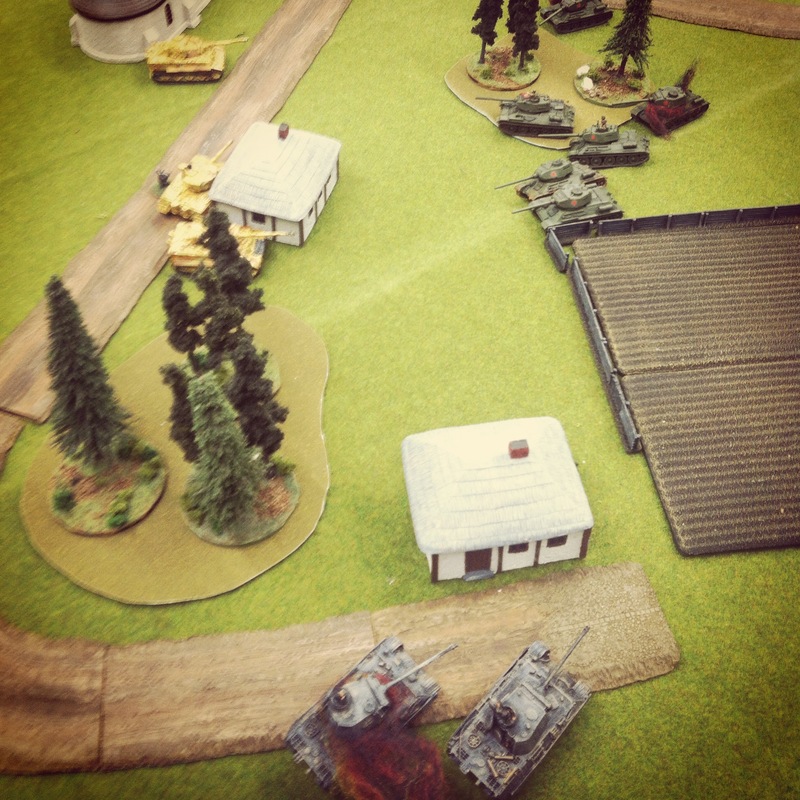 The Tigers sat at the middle of the table, looking to attack from behind two huts and defend an objective. 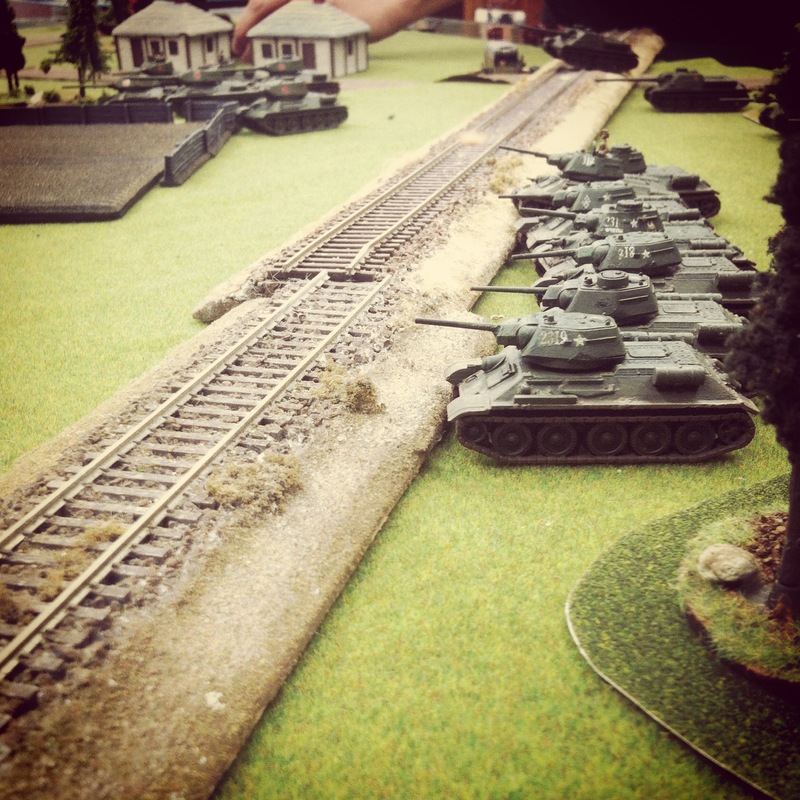 My Panthers and Panzer IVs took up position on my right, hoping to stall the massed T-34 assault over the railway. 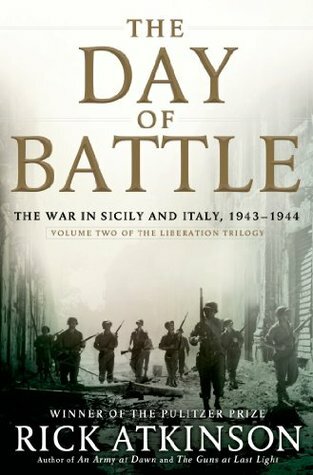 The game quickly divided into three main fronts. The Panzer IVs and Panthers dueled over the railroad with the T-34 obr 1942s. 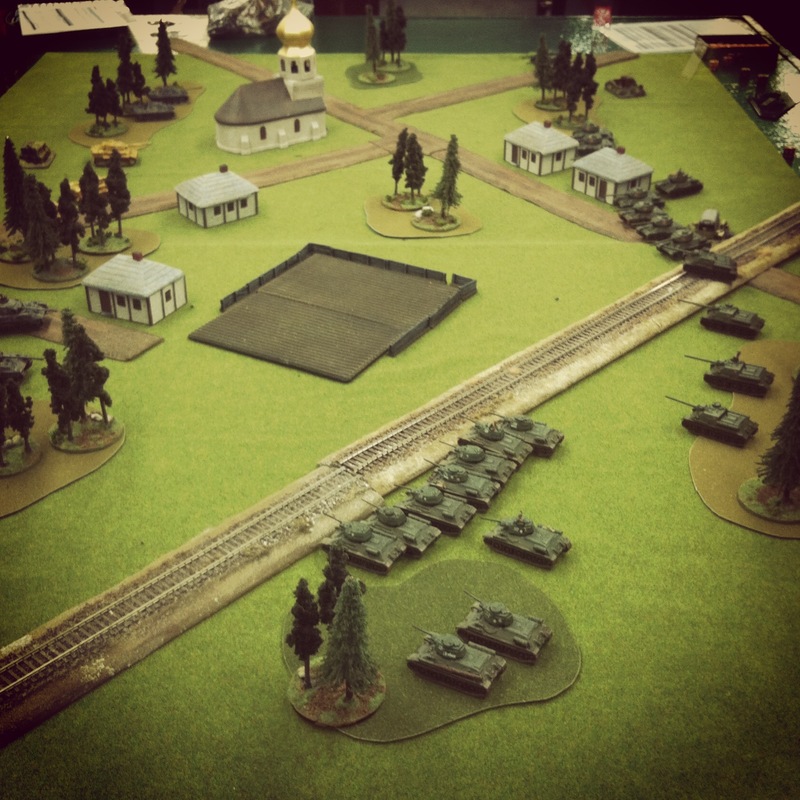 In three successive turns, the advancing Russian tanks were hit twice and then fled the field with a failed morale test. Along the way, the Germans lost a Panther from the command HQ and a Panzer IV, cutting German tank force in half on that end of the table. 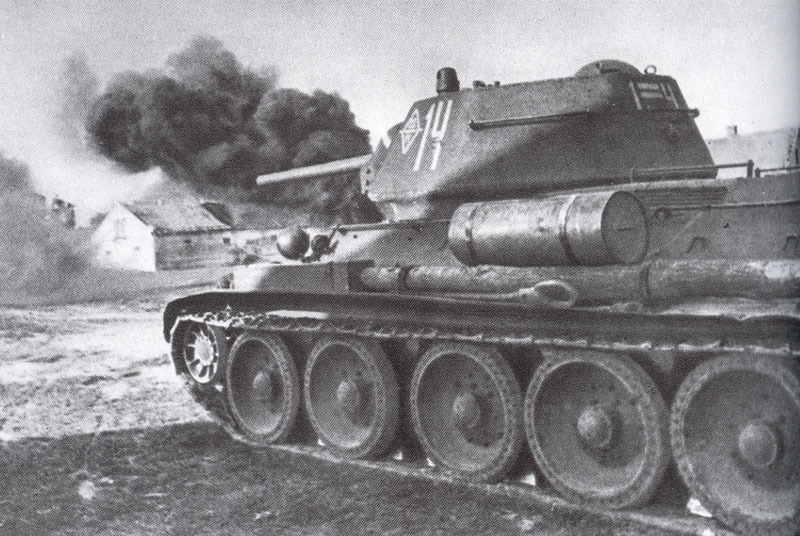 At the table’s center, the T-34/84 obr 1944 tanks moved into position around the central forest and fields. 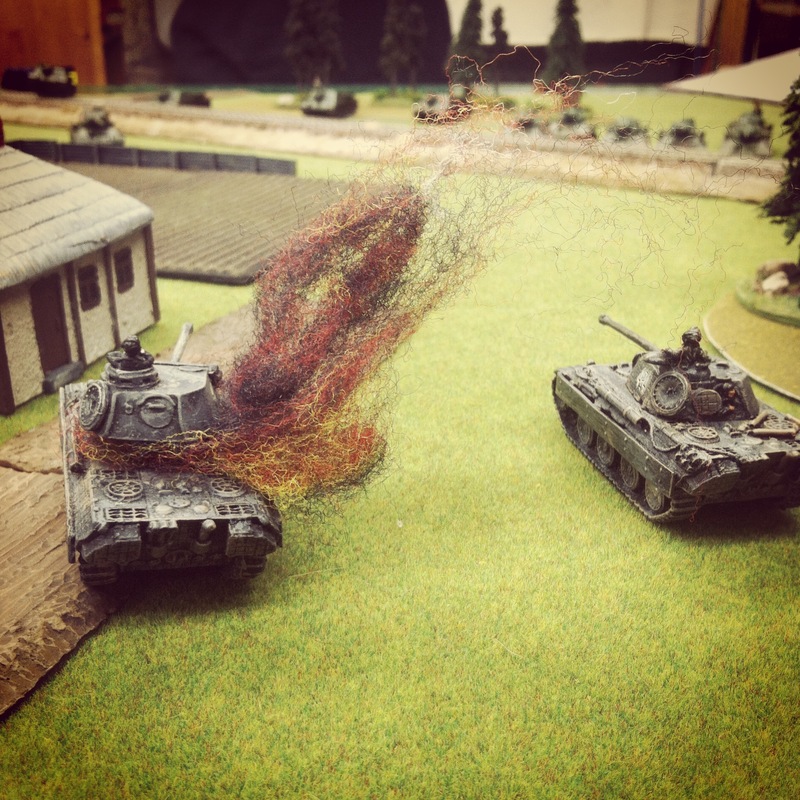 The Tigers moved in and out of cover, taking deadly shots. By the third turn, two of the Tigers had been bailed by combined fire from the T-34/84 obr 1944s and the SU-100s on either side. Struggling to remount their tanks, two Tigers were destroyed and the remaining tank fled the field. 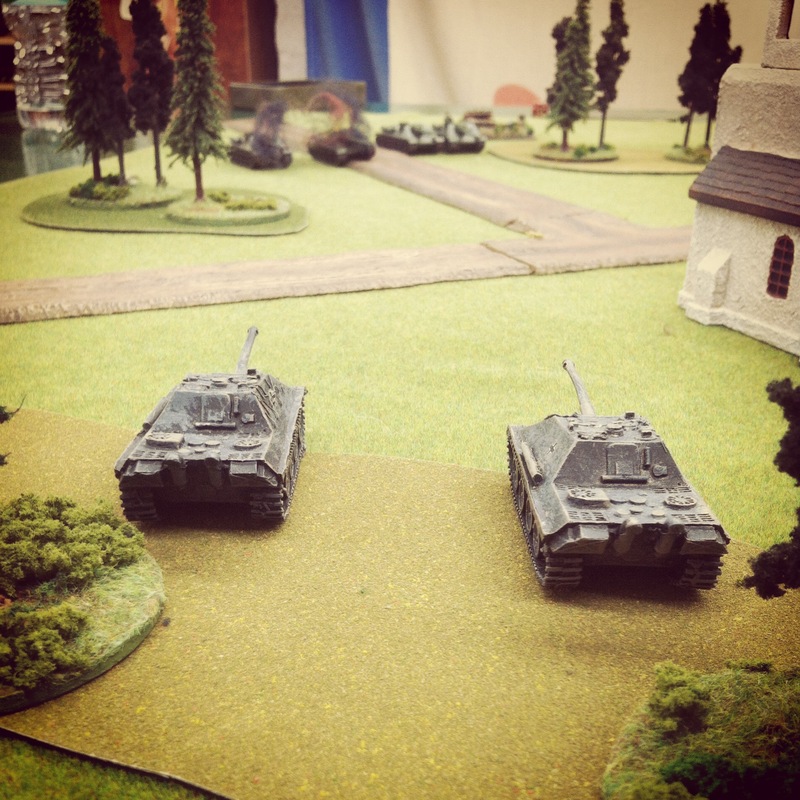 Beyond the church at the German left, the two Jagdpanthers destroyed the SU-100 guns in front of them in two turns. 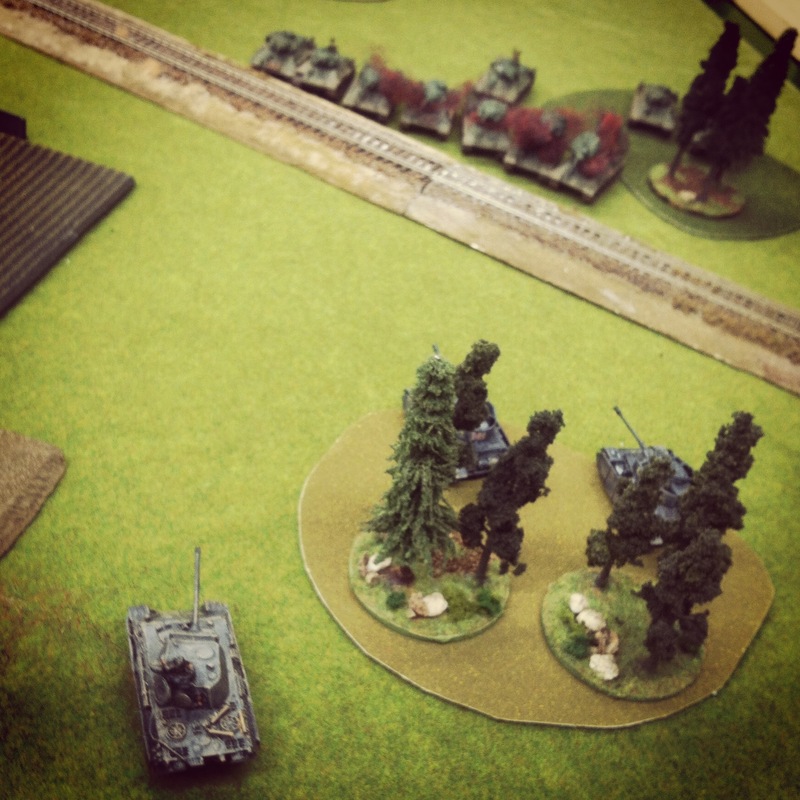 With the flank open and the rest of the table locked in mobile tank duels, the Jagdpanthers fired their engines at the double to occupy the objective beyond the burning SU-100s. 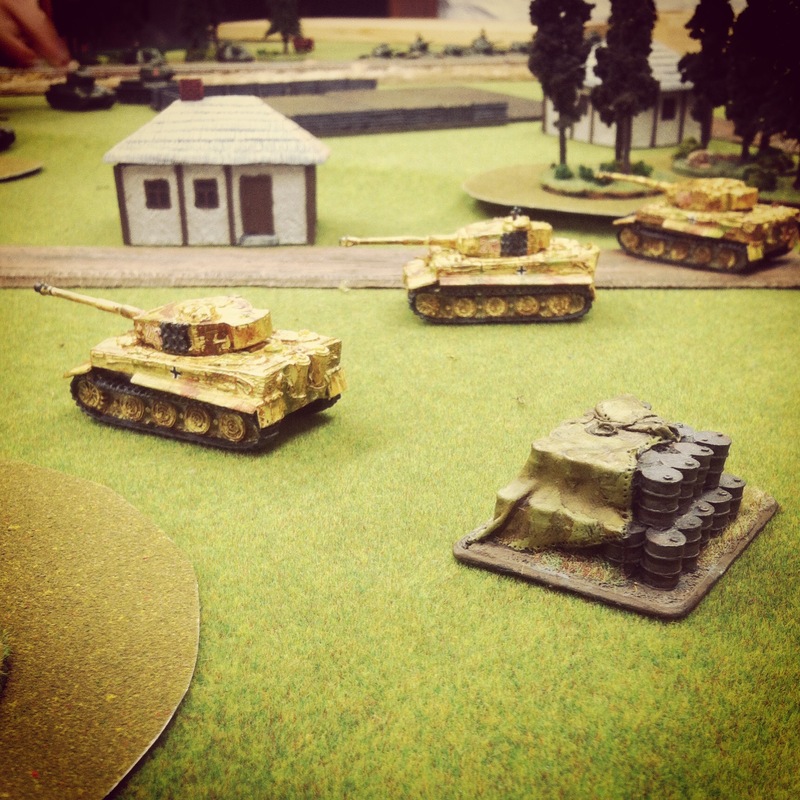 With the Germans below half-strength following the destruction of the final Panzer IV, the game came down to one company morale check which the Germans passed to win. We were both pretty pleased with how evenly matched the game had been on the Eastern Front. The sheer number of tanks kept the Soviets in the game even as the Germans rolled devastating hits in almost every turn. 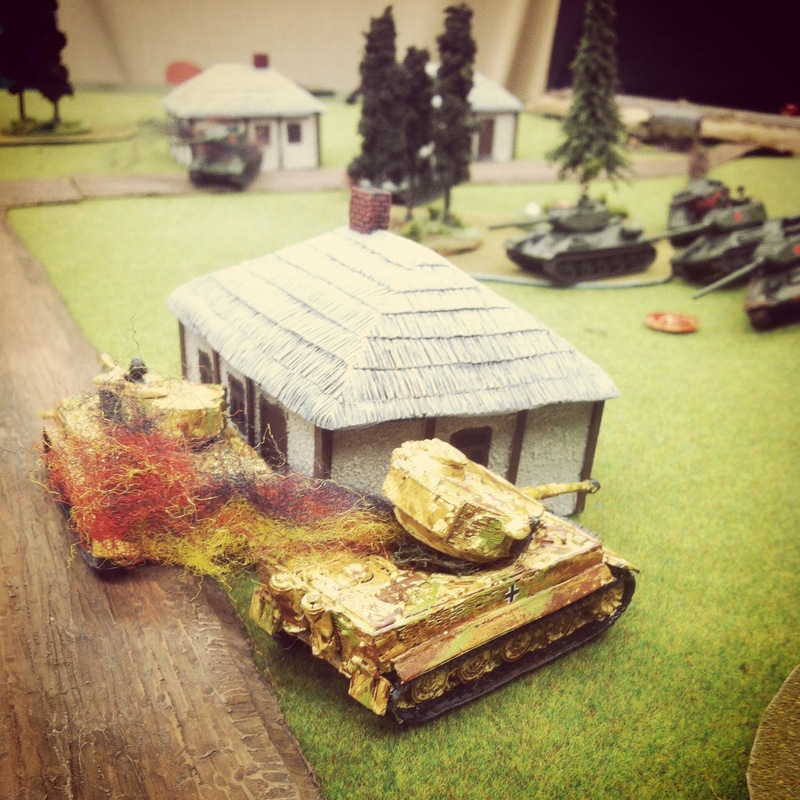 The SU-100s at the railroad, on the other hand, managed to miss most of the game until their combined fire with the T-34/84 obr 1944 platoon ran the Tigers off the table. I’ve spent the past couple years gaming back and forth across Western Europe from D-Day onward, so a new front and some new forces was a great change of pace. 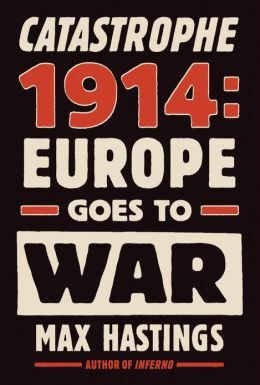 Leafing through the rest of Desperate Measures, I can see there’s plenty of opportunity to run around more tanks and maybe even some poor, unlucky troops on the Eastern Front again soon.